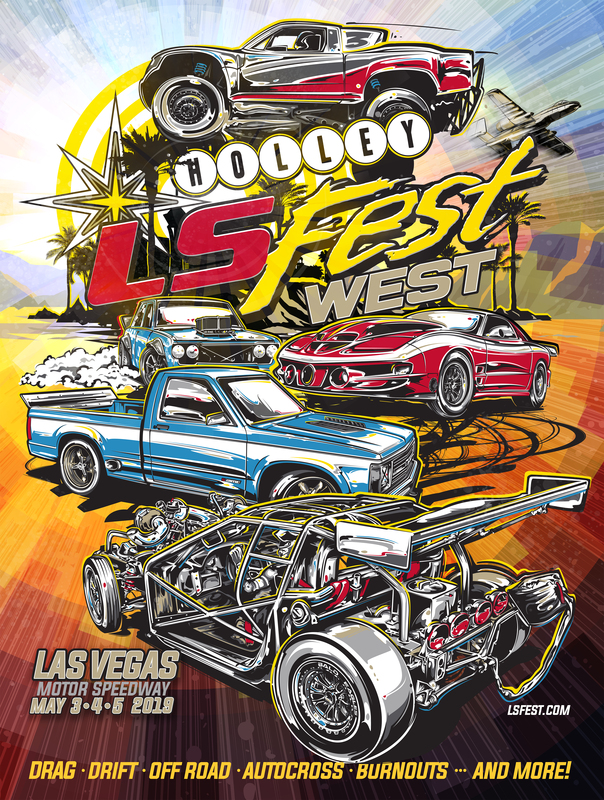 Accomplished automotive artist Brian Stupski just revealed his latest artwork for the 2019 LS Fest West event poster. It’s a beautiful piece of gearhead art showcasing some of the actual vehicles that have attended LS Fest West. Participants and spectators alike can pick up their own poster onsite at the Holley promo tent throughout the event while supplies last and hang them up back home. In the foreground you’ve got none other than “Leroy the Savage”, a stripped down, twin turbocharged, Holley EFI powered C5 Corvette piloted by YouTube personality and auto enthusiast Cleetus McFarland. Sliding through the background is Marcus Fry’s drift-spec Datsun 510 laying down a smoke screen. Truck category Grand Champion winner Kevin Phillip’s ’91 S10 and Outlaw 275 Champ Brian Monello’s 4th gen Trans Am round out the rest of 2018 winners featured. Road going vehicles aren’t the only aspect of the event Stupski was able to capture in his latest work. “As an artist who enjoys all forms of motorsport, these are especially fun pieces as I’m not limited to just taking inspiration from just drag racing or autocross, but I get to capture every aspect of this huge event. And besides, it’s not often I get to throw an A-10 Warthog into the mix. Did I forget to mention that there’s an air show as well? Yeah, there’s an impromptu air show, too, thanks to the incredible servicemen and women stationed next-door to the event at Nellis Air Force Base.” LS Fest West attendees can expect to see any number of our nations fighter jets and planes performing normal Air Force testing aerial exercises, from A-10 Warthogs all the way up to the latest F-35 Joint Strike Fighter jets throughout the weekend. Event info: LS Fest West is a celebration of everything and anything powered by the incredible GM LS engine! If an LS based (or current generation LT) engine is powering your ride or if you are considering a swap to LS power, this is your event! Race cars, street rods, rat rods, muscle cars, trucks, late models – you name it, if it is being powered by an LS there will be something here for you! Take part in our drag racing classes, drifting, autocross, 3S Challenge, Track X, Show-N-Shine, Mr. Chows Side Show and more! Event/class champions will be crowned as well as an overall event champion for those that want to compete in multiple events. Check out the rest of the site and make plans to join us! For more information check out our event website or follow us socially on FB.